Ash Williams is back, dear readers. For Starz’s upcoming spinoff series, Bruce Campbell will reprise his role as the clumsy yet endearing hero, and the latest trailer for the series showcases that Ash Vs. Evil Dead will retain the IP’s love for excessive blood and undead action. Chainsaw in hand – or rather attached to hand – the footage is a delightfully violent look at Campbell’s returning hero. Slaughtering Deadites with a cocksure grin, Ash Vs. Evil Dead will have Campbell join forces with his new allies: Pablo (Ray Santiago) and Kelly (Dana Delorenzo). Lucy Lawless is also on board to play the mysterious Ruby, who has one eye trained on Ash as she believes it was him who unleashed the supernatural curse in the first place. Chip firmly on shoulder, it seems Lawless’ character will be as big a foe for our group of heroes as the Deadites. Due to premiere on the network in October, fans of the genre-defining original will be hoping that Ash Vs. Evil Dead can exorcise any feelings of disappointment looming over the IP. Starz’s new series will have a ten-episode run, with the first being directed by Sam Raimi, the man behind the beloved 1981 original. Cancel your Halloween plans: Ash vs. Evil Dead premieres on Saturday, October 31 at 9 p.m. ET. It’ll run for ten episodes. 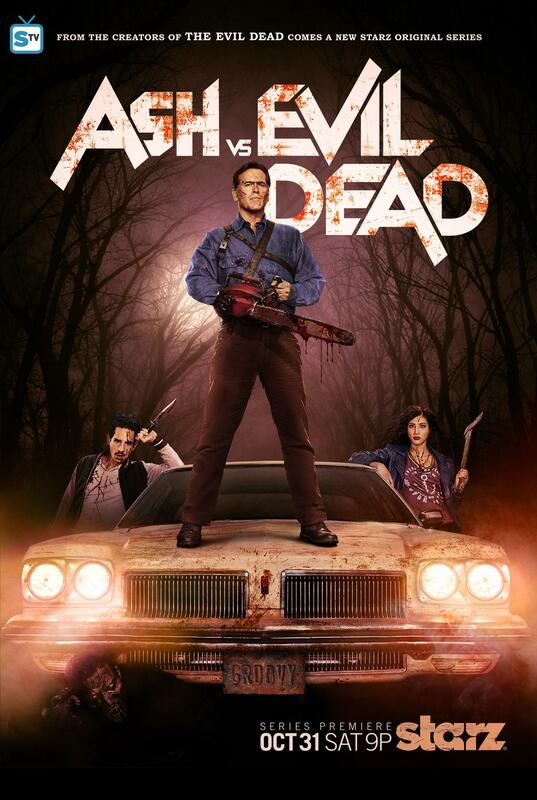 Bruce Campbell will reprise his role as the title character Ash, a stock boy, aging lothario and chainsaw-handed monster hunter who has spent the past three decades avoiding responsibility, maturity and the terrors of the Evil Dead. When a Deadite plague threatens to destroy all of mankind, Ash is finally forced to face his demons — personal and literal. Destiny, it turns out, has no plans to release the unlikely hero from its evil grip.